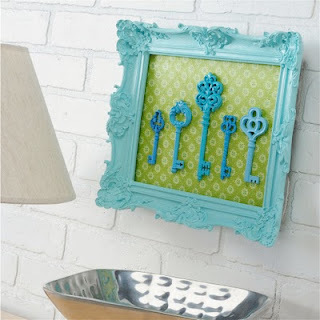 She Loves To Craft: Key Wall Art - Mod Podge Rocks! When I saw this little piece of wall art over at Mod Podge Rocks!, I completely fell in love. I am such a sucker for lime green and turquoise, and I love 3-D artwork and shadow boxes. I think it would look equally stunning if you used pink paint paired with black and white polka dot fabric. Amy was kind enough to put together a wonderful tutorial, which can be found here. Now, I don't exactly have a key shadow box laying around, but I'm going to be on the lookout for inexpensive skeleton keys and an ornate thrift store frame so that I can make my own version. I highly suggest that you peruse the rest of her blog for tons of projects utilizing that crafting staple that we all know and love, Mod Podge.